PHILADELPHIA — Long before she was an Olympian or a UFC champion or — after Sunday night, a WWE regular — Ronda Rousey had a well-honed prefight ritual. As a UFC fighter, these naps became sacred to Rousey. Anyone who’d interrupt wasn’t just asked to leave the dressing room, but they were also snarled at, cussed out or thrown out. That’s how tense it was before her fights. That’s how much pressure she felt, not just to win but also to carry the mantle for women in combat sports, and maybe everywhere. Winning became relieving, not joyous. “Thinking back on it now — every single title fight that I won, I cried myself to sleep that night. Every single one,” she said. 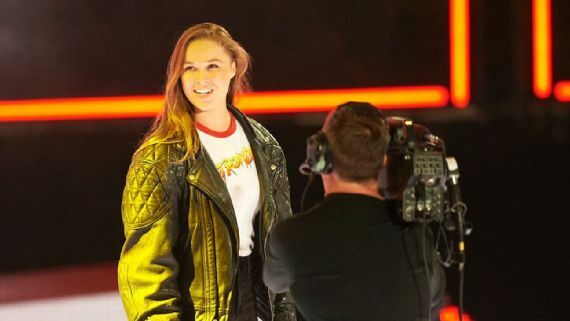 There was plenty of noise in Rousey’s dressing room Sunday night before she made her appearance at the Royal Rumble. But it had a completely different feel. She was loose and light and happy. Next Story → WrestleMania 35 Location Finalized?